After a busy Saturday spent manhandling a Rug Doctor, I was happy to learn that I'd have a few hours of Sunday afternoon freedom. 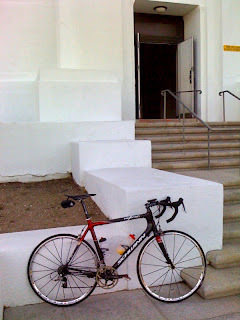 And not wanting to blow it by sticking around at home, likely spending time examining the insides of my eyelids or tuning up yet another bike from the fleet (or worse - sitting around as I am now - on teh innernets), a bike ride naturally was on the top of my list of things to do. Normally I would never put my bike on the car for a road ride. 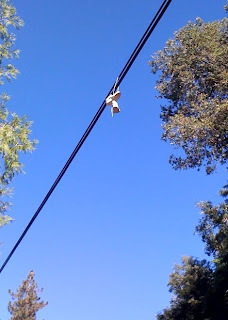 Something is inherently wrong with that scenario to me. 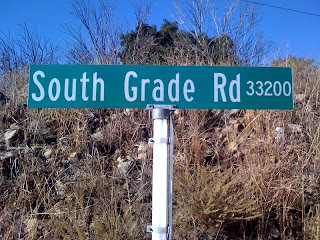 One of the best aspects of road riding is the fact that there's a road right in front of my house. 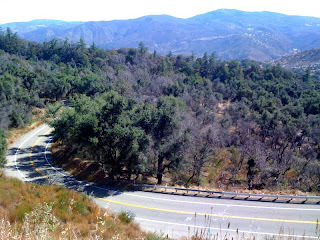 Which in turn connects to many other roads in the area, plenty of which offer fantastic riding opportunities. But I can ride out of my house any old day - heck, I do it virtually every weekday morning on my commute to work, mixing up the route on a daily basis to keep it fresh. 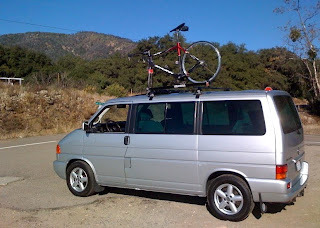 So the plastic bike was affixed to the van's Yakima bike mount and I headed northeast to the base of Palomar Mountain. 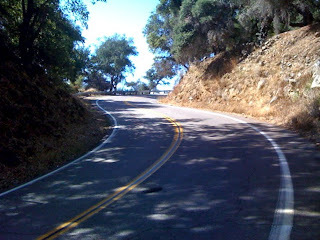 I chose to hit the mountain on South Grade Road. 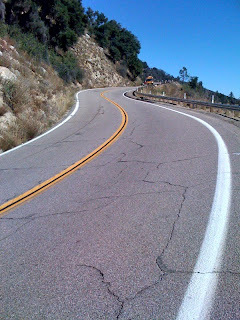 Winding back and forth up the mountain, South Grade rises about 2500' over 7 winding miles of back-to-back hairpin turns, decreasing radius corners and smooth pavement. 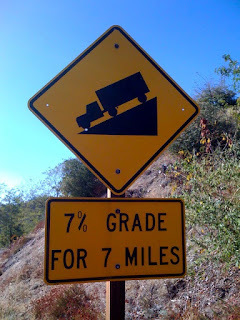 But first I had to climb the mostly 7% - 9% grade. I settled into my 39 x 23 gear for a short distance before realizing I'd become intimately familiar with my 39 x 26 - the lowest gear the plastic bike has to offer. Cruising along at a steady 8-10 MPH with the ticker pumping at 160-165 BPM, I was passed by a steady stream of sport bikes - buzzy high-strung Japanese bikes flirting with their 14,000 RPM redlines and throaty Italian Ducatis producing angelic exhaust notes. 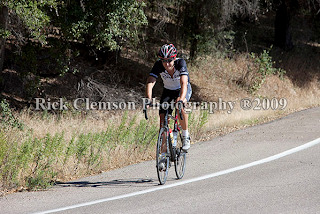 Descending bikes peppered the air with the pungent smell of overheating brakes. 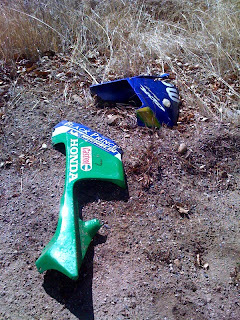 When riding that slowly, I really start to take in the environment - litter and other debris. This bit of debris shows just how unforgiving the road can be. 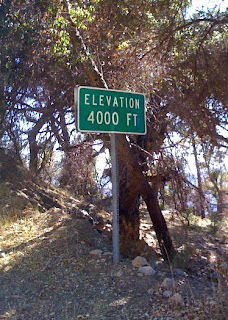 After a few miles of steady climbing, I found myself reaching for a non-existent lower gear. 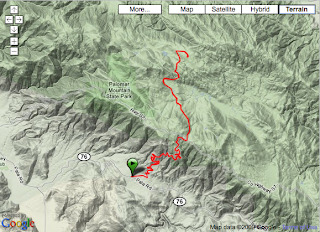 Finally I just dealt with it and enjoyed the ascent. 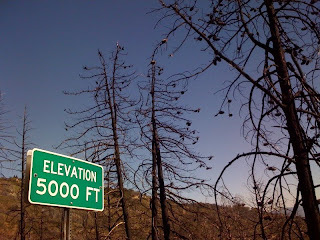 Around the 5,000' level lies the remains of a forest scorched by a fire. 2007? 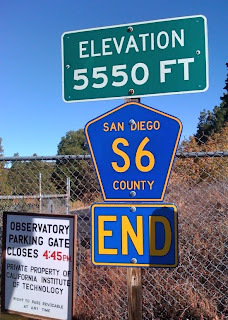 Although my speed dropped slightly in the thinner air, I didn't notice the altitude as a hindrance. 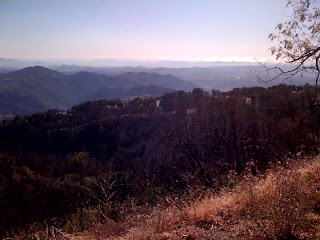 If anything the lower temps made for a more pleasant climb as I reached the top. 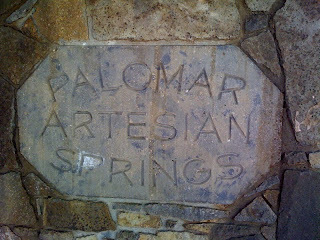 One curiosity spotted along the way are some defunct Palomar Artesian Springs vending taps. According to a sign posted, you could get a gallon for a quarter at one point. I can't find out when the taps were removed. 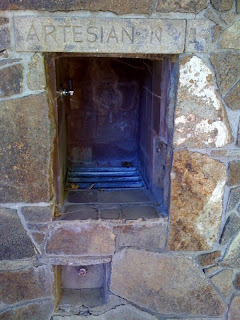 Would have been great for topping up the bottles (if I would have had a quarter on me). 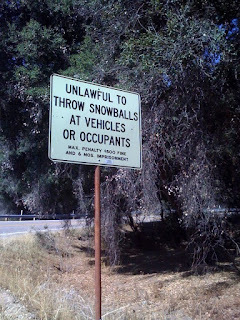 No chance of getting smacked with a snowball today (but I would have really appreciated it - the temp at the base of the hill was 92 and it only cooled off into the low-70s by the summit). Yep, San Diego County does get snow from time to time. I'm told that the road is a zoo when the first snowfall comes with all sorts of SD residents bringing their kids up to experience a winter wonderland. ...so I took this time for a break. Topped up the bottles, drained the bladder and walked around the grounds. I didn't take the tour - I want to do that with the grrrls as a field trip this winter, but from what I saw I can report that it's quite an impressive structure. 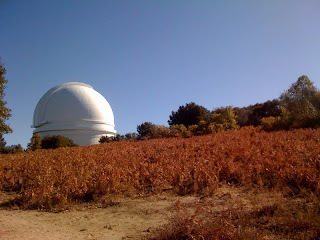 Housing the 200" Hale Telescope with a lens that took 13 years to grind, the telescope has been used every clear night since 1949. Definitely looking forward to a return trip. But first one more view from the top. Popped the plastic bike into the 53 x 12 and had a blast carving the corners. 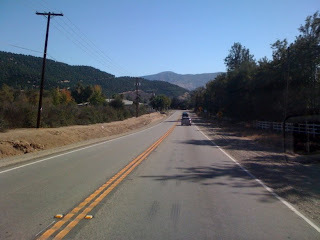 A few motorcycles startled approached from behind with the wind limiting my hearing as I was averaging speeds of 30-40 MPH. On the descent I did manage to pass one vehicle - a truck towing an auto trailer. At the end I was able to descend in 12 minutes what had taken me 50 to climb, and now the bike's brakes had a fine coating of black rubber powder that had formerly been my brake pads. I Loaded the plastic bike on Klaus, killed off the remains of my water bottles and a Coke and inhaled a Clif bar. 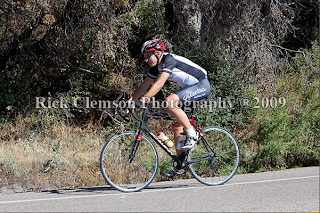 Addendum - photographer Rick Clemson caught me right about at 3,000' elevation. He's up there most Saturdays and Sundays shooting motorcyclists and bicyclists and sells the shots on his website (without the watermark of course).